Lines are drawn along the top of the superior tilted vertebra and the bottom of the inferior tilted vertebra. Two more lines are drawn at an angle of 90 degrees to these lines, perpendicular so that they intersect. The resulting angle is measured, and the number is expressed in degrees. 1. It is a two-dimensional measurement of a three-dimensional condition. Scoliosis involves all three dimensions of the spine: front-to-back (sagittal), top-down (axial), and side-to-side (coronal). 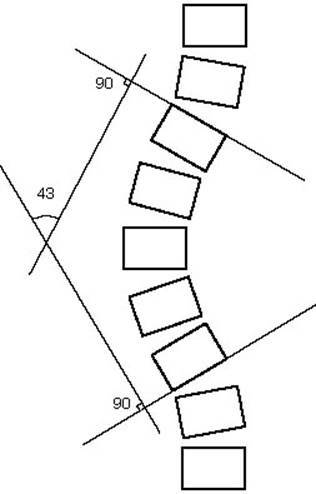 The Cobb angle only measures the tilt of the spine in one plane. It does not capture the full picture of the position of every bone in the spine. 2. Cobb angle can change if different vertebrae are used to measure it. Always be sure that the same bones are used to measure Cobb angle. Also be aware that even if the same vertebrae are used, small differences in how the doctor draws the lines can lead to significant inaccuracies in the measurement. These inaccuracies can be as great as 5 degrees. For this reason, caution should be made in comparing two x-rays if the difference in Cobb angle is less than 5 degrees. The apparent difference could be due to measurement error, and not to any actual change in the position of the spine. 3. It is not a linear measurement. Due to the three-dimensional rotation of the spine, Cobb angles measurements made on a two-dimensional x-ray do not represent an increase in the severity of the scoliosis in a uniform fashion. In other words, a 40 degree Cobb angle is more than twice as severe as a 20 degree Cobb angle. Reducing a 60 degree scoliosis by 10 degrees represents a far greater accomplishment than reducing a 20 degree scoliosis down to 10 degrees. As the Cobb angle increases, the actual curvature of the spine becomes exponentially more severe. CLEAR advocates using multiple systems of measurement to assess the spine, as well as the health of the individual. Measurements should quantify the position of the spine in all three dimensions, not just one. Functional and cosmetic assessments should be included and compared alongside the Cobb angle. If the Cobb angle improves, but the patient’s appearance and lung function get worse, should this truly be considered a successful outcome? In the CLEAR approach, seven specialized “spot” x-rays are used to analyze the position of the spine 3-dimensionally. The 76 measurements made on these x-rays are then used to prepare an individualized treatment plan and exercise program for the patient. There are other, less common, systems for assessing scoliosis. The Risser-Ferguson method draws dots in the center of the superior, apical, and inferior vertebrae, and lines to connect them. A CT scan can measure scoliosis three-dimensionally, but the high levels of radiation limit this method to pre-surgical evaluations. One new measurement technology is the EOS 3-D x-ray imaging system, which allows for a much more precise measurement of the spin with significantly less radiation than a CT scan. Developed by researchers at Hong Kong Polytechnic, this new system has been shown to be very accurate in measuring scoliosis without the use of x-rays. It’s possible to measure scoliosis on a MRI, and while there is no radiation exposure, the high cost precludes its common use. Typically, MRI is only used for scoliosis when an underlying pathology, such as a spinal cord tumor, is suspected. Scoliosis can also be assessed through surface topography, which is a system for measuring the shape and contours of the back. Although effective, the technology is expensive and cannot be compared to the Cobb angle. Scoliometry is a simple and efficient way to conduct scoliosis screening, and has some use as a monitoring tool. If scoliometry measurements increase over time, this may be an indication to take an x-ray. If the measurements are stable or improving, it may be safe to assume that a re-x-ray is not needed.